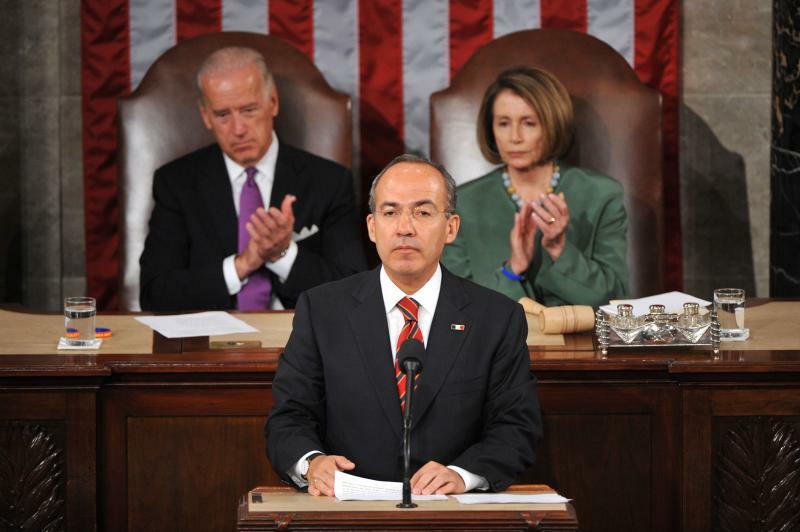 PRESIDENT FELIPE CALDERON CRITICIZED THE ARIZONA LAW DESIGNED TO ENFORCE ILLEGAL IMMIGRATION DURING A JOINT SESSION OF CONGRESS ON MAY 20, 2010 IN THE HOUSE OF REPRESENTATIVES. VICE PRESIDENT JOSEPH BIDEN AND SPEAKER OF THE HOUSE NANCY PELOSI APPLAUDED MR. CALDERON'S CRITICISM OF ARIZONA'S LAW. During a recent two-day state visit to Washington, D.C., Felipe Calderon, Mexico’s president, lectured Americans on immigration policy. Mr. Calderon specifically criticized the law passed by the state of Arizona, which was designed to enforce federal law against illegal aliens in the United States because of lack of enforcement of immigration laws by the federal government. “Despite their enormous contribution to the economy and society of the United States,” there are persons who “still live in the shadows, and at times, like in Arizona, even face patterns of discrimination,” Mr. Calderon said at a ceremony at the White House to begin his visit. “We will retain our firm rejection to criminalize migration so that people that work and provide things to [the United States] will be treated as criminals,” Mr. Calderon said. The three members of the Obama Administration who attended Mr. Calderon’s speech to Congress — Attorney General Eric Holder, Homeland Security Secretary Janet Napolitano and Interior Secretary Ken Salazar — all joined in the ovation for Mr. Calderon. Many question the right of Mr. Calderon to criticize the United States when his own country is intolerant of civil rights. “Mexico is a total police state where its inhabitants and anyone who dares visit are subjected to some of the most draconian and brutal law enforcement measures on the planet,” wrote Paul Joseph Watson and Alex Jones in an article at prisonplanet.com. 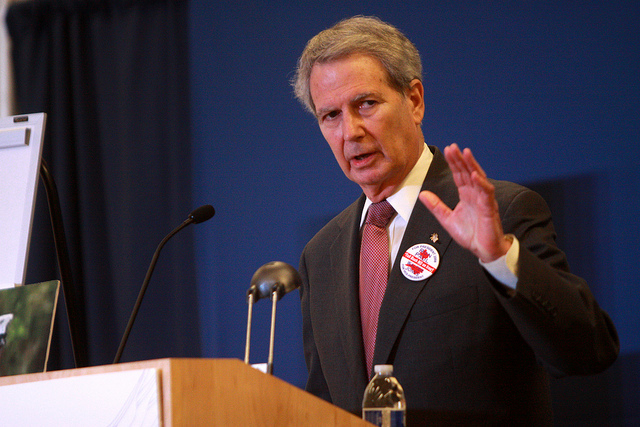 I must say that I resent President Calderon coming into our country and criticizing our immigration laws. Medico has some of the strictest immigration policies in the world, yet Mr. Calderon has the audacity to come into our Congress and criticize our laws. That is outrageous, and I am extremely disappointed that other members of Congress and the Obama Administration choose to applaud those remarks. America is fed up with the drug cartels, human trafficking and the array of other criminal activity that continues to overload our southern border. It is not the place of President Calderon to come into our country and criticize Arizona for passing a measure designed to give law enforcement reasonable tools to protect the people. It would be more productive for the President to assist us in our efforts by discouraging his citizens from entering our country illegally. “I don’t think we should have some foreign leader come in here and criticize the statute of a state, where they are implementing a federal law on a state basis,” said Sen. Orrin Hatch of Utah about Mr. Calderon’s statements. “It was inappropriate for President Calderon to lecture Americans on our own state and federal laws,” said Sen. John Cornyn of Texas. I am so very ashamed of our United States Government for giving the Mexican President praise and applause for coming here and degrading my country!! I am simply livid!! This man has No right to come and discuss our people and our laws — he can’t even run his own country and take care of his people. I’m tired of my President apologizing all over the place for our beliefs. I’m sick & tired of supporting all these ILLEGAL immigrants!! . . . And why hammer Arizona for doing what’s supposed to be YOUR job!!! . . . I’m fed up with illegals looking to me like I owe them something! Either be an American for Americans or get to hell out of my house!!! I saw it. I saw the spectacle. I watched a little bit of it. Felipe Calderon’s speech to a joint session of Congress beating up on the Arizona law, criticizing the Arizona law and blaming us for al the guns in Mexico. And the Democrats standing up and applauding, giving him a standing ovation for this. This is unprecedented. We have never before had an ally come to the United States, make a speech before a joint session of Congress, rip our country, rip our states and have the Democratic Party stand up and applaud. . . . It’s very, very troublesome.